With a significant emphasis on building product portfolios by key players, the global fluorochemicals market has become saturated, especially in North America and Europe, observes Transparency Market Research in a recently published report. Most of the manufacturers are striving hard to match up to the endless demands of fluorochemicals from numerous sectors. There are several businesses who are shifting their focus towards expanding in emerging economies in Asia Pacific and the Middle East and Africa. Some of the prominent players in this market are Daikin, Asahi Glass, Honeywell, Mitsui Chemicals, DuPont Inc., and Solvay SA, amongst several others. The global fluorochemicals market grossed US$16.88 bn in 2016. During the forecast period from 2016 to 2025, the market is expected to increase with a healthy CAGR of 5.3%, and reach a valuation of US$26.71 bn by the end of 2025. In the global fluorochemicals market, the product segment of fluorocarbons is expected to dominate the market in the next few years. This is mainly due to the rampant use of these compounds in packaging industry as refrigerants, aerosol propellants, and blowing agents. The segment’s leading position is also due to the strength and stability of the compounds’ covalent bonds, which make them appropriate for usage as solvents, lubricants, and stain repellants. 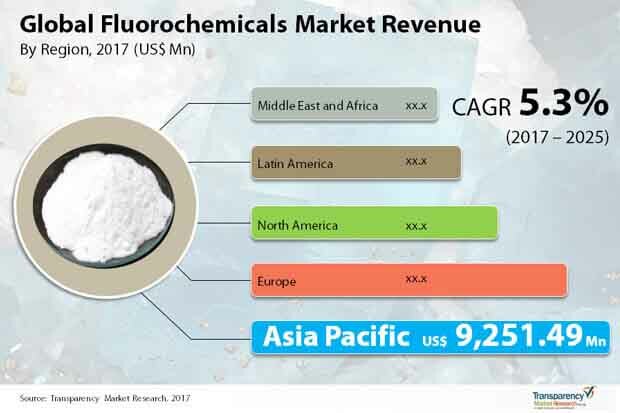 The global fluorochemicals market is spread across five key regions: Europe, Asia Pacific, Latin America, North America, and the Middle East and Africa. Of all these regions, Asia Pacific is predicted to depict maximum growth rate in the next few years, with a rough value estimation of US$15.21 bn by the end of the forecast period. Other markets such as the Middle East and Africa and Latin America are also expected to show a high growth rate during the same forecast period. One of the foremost driving factors for the global fluorochemicals market is the rising demand for refrigerants. These are mainly required for ventilation, heating, air conditioning, HVAC, and even in the food and beverages sectors. Compounds such as hydrochloroflurocarbon (HCFC) and hydrofluorocarbon (HFC), which are included under the fluorochemical products, are prime components needed while manufacturing the hydrocarbons. Hence, the rise in use of these hydrocarbons is significantly responsible for providing a tailwind to the market. Another factor that is expected to propel the global fluorochemical market’s growth is the increasing use of air conditioning, heaters, and other sources of ventilation. The various advantages of fluorocarbons is another factor that is being perceived as a prominent market growth propellant. Some of them are anti-corrosive characteristics, high electrical insulation, resistance to chemicals and heat, repellant nature to oil and water stains, etc. Countering the growth in the market, however, are several restraints too. They have directly affected the revenue generation of the global fluorochemicals market. A prime obstacle is the rising environmental concerns regarding usage of these fluorochemicals, which has caused several governments to form regulations to slowly phase out their utilization. Another restraint involves non-uniform availability of the source fluorospar mineral, without which fluorochemicals cannot be made. However, newer products and less harmful fluorocarbons are currently in the research and development phase. Once introduced in the market, they will help overcome the environmental challenge. One of the foremost driving factors for the global fluorochemicals market is the rising demand for refrigerants. In the global fluorochemicals market, the product segment of fluorocarbons is expected to dominate the market in the next few years. The study presented here is based on a report by Transparency Market Research (TMR), titled “Fluorochemicals Market (Product - Fluorocarbons (HCFC and HFC), Fluoropolymers, and Fluoroelastomers; Application - Refrigerants, Aluminum Production, Aluminum Foams, and Electricals and Electronics) - Global Industry Analysis, Size, Share, Growth, Trends, and Forecast 2017 – 2025”.